Russian prisoners captured in the fighting near Tarnopol, July 1917. 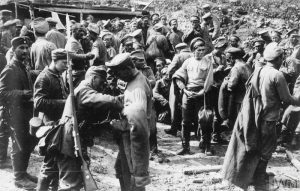 A German guard is searching a Russian soldier in the foreground. Image courtesy Imperial War Museum © IWM (Q 86646). This entry was posted on July 24th, 2017.